William Bendix created the Life of Riley character and was starred in the radio version of Riley which began airing in 1944. He was not available for this early TV version due to contractual obligations. 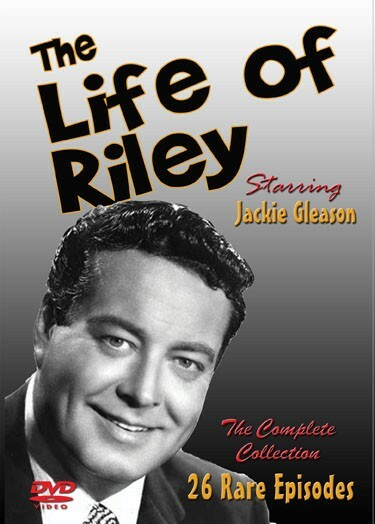 Life of Riley with Jackie Gleason also starred Rosemary DeCamp, Lanny Rees and Gloria Winters. Riley’s Tonsil Operation, Babs And, Simon Step Out, Egbert’s Chemistry Set, The French Professor, Nervous Breakdown, Assistant Manager, Riley’s Brithday Gift, Riley, Gillis, Vanderhopper, Inc., Junior Falls For His Teacher, Night School, The Prom Dress, The Boarder, Peg’s Birthday, Junior Drops Out, Insurance, The Gambler, Acting Lessons, Valentine’s Day, Home Sweet Home, South American Job, Riley’s Quarrel, Junior And The Bully.